But don’t think the guide obsolete just yet. 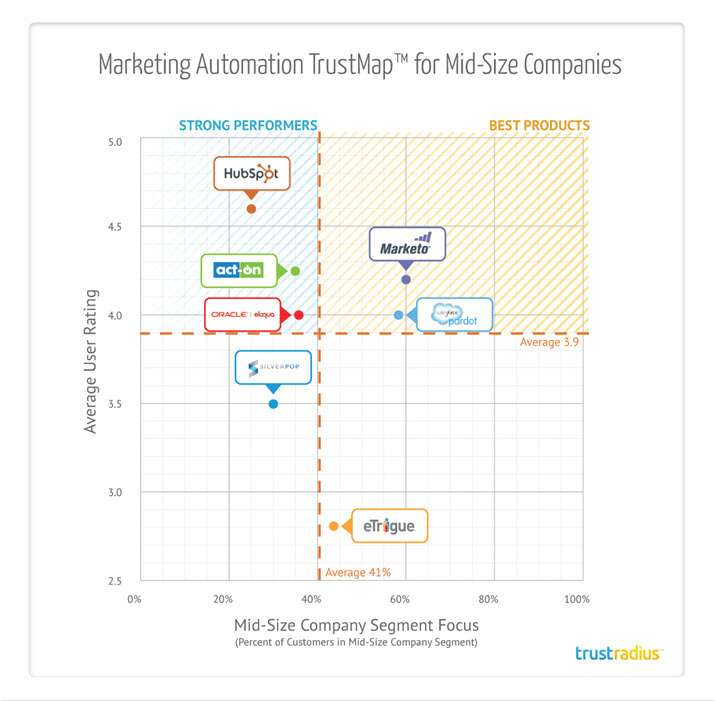 The TrustRadius guide segments the marketing automation market by the size of the company that each product serves (Small, Mid-Size, Enterprise) and then rates solutions within each category in visual grids based on user ratings and how much it deems a company’s solution is focused on that particular segment. I often tell clients that there is no one “best” marketing automation solution for everyone, and that the decision of what makes sense for one company vs. another depends on a wealth of factors, notably organization size, available resources, business model, and the scale of your marketing ambition. The TrustRadius grid system is a construct that seems to serve this category well. In sum, the guide is a useful resource both for business buyers considering the leap into marketing automation, or more seasoned users contemplating the shift to a new solution. My contributions to the guide, largely responses to questions seeking advice for first-time buyers, are reproduced below, with permission. (TR) What high-level advice would you give to people/companies considering implementing marketing automation technology for the first time? Specifically, beyond technology selection what else should they be thinking about? (HS) By far the #1 issue we see with companies who invest in marketing automation is the lack of an overall plan or strategy. Too often companies make the assumption that simply the act of deploying a marketing automation platform will result in marketing efficiencies. Without at least the semblance of a plan or strategy for how the company plans to use the system, marketing automation is doomed to be little more than email software. The fact that marketing automation technology is simpler than ever is a double-edged sword. Most systems are very quick to deploy and easy to use. Compared to years past, that’s an advantage, to be sure, but it also means that companies can be too quick to “flip the switch” before really constructing a plan for how to realize maximum value. 1. What the business metrics that we hope to impact? 2. What are the quantitative differences we hope to achieve? 3. What are the specific strategies we plan to deploy to achieve success? I’d also advise clients not to underestimate the amount of resources required to make the most of a marketing automation system. Again, this has less to do with managing the software per se, and much more to do with developing the campaigns, programs, strategies, and content that are the fuel for a successful deployment. At bare minimum, expect to dedicate one-half of a full-time employee (or the equivalent services from an outside firm) in order to get the most from your investment. (TR) Marketing Automation drives a need for a significant amount of content. How should companies address that problem? What sort of content works best? (HS) The type of content that works best in the context of a lead nurturing or emarketing program is usually informational, “thought leadership”-type content that speaks to best practices, strategies or techniques for solving the type of business problem that the marketer’s product or service addresses. It’s this type of content that will drive a higher level of engagement, build credibility, and ultimately drive a dialogue with sales. Conversely (and counter-intuitively), content that overtly “sells” a product or service, particularly early in the sales cycle, has a greater chance of alienating the reader. Not every piece of content has to be a new, 12-page white paper, however. We advise clients to look at recycling, or repurposing, existing content. Perhaps an old white paper can see new life as a checklist, a Webinar/Slidecast, a series of short videos, or an infographic. (TR) There’s some debate about the definition of marketing automation. In your mind, does it encompass inbound or do you define it more narrowly to be lead nurturing or other? There’s a move towards “all-in-one” marketing platforms. Hubspot and Act-On encompass many inbound features as well as outbound. Marketo has done a couple of acquisitions. Do you have any guidance on how marketers should think about “all-in-one” vs. best of breed? (HS) It’s correct to say that traditionally, “marketing automation” has come to mean software designed more for lead nurturing vs. generating inbound leads. I’m not a market analyst, but I have no quarrel with Hubspot, for example, calling themselves “marketing automation” even if their technology is more about generating inbound traffic than it is about automating the way those leads get filtered, nurtured, and converted into opportunities. I don’t think any solution, certainly not today, “does it all.” We have many clients who use Marketo and Hubspot side-by-side, for example. Or take a newer solution like Captora, who very specifically position themselves as feeding the top of the lead funnel, at the same time that they trumpet their integration with more traditional marketing automation systems. I’d be very skeptical of any solution that claims to be an “all-in-one” marketing system. With today’s cloud-based software and open architectures, there’s little reason not to pursue a best-of-breed strategy. This entry was posted in B2B Marketing, Campaign Planning, Demand Generation, Lead Management, Lead Nurturing, Marketing Automation, Marketo and tagged Act-On, Captora, hubspot, Marketing Automation, marketing automation agency, marketing automation buyer's guide, marketing automation consultant, marketing automation tips, marketo, Marketo agency, Marketo consultant, Marketo partner, trustradius on April 16, 2014 by Howard Sewell. Thanks again for contributing excellent insights to the guide Howard. As you state, the marketing automation sector is extremely dynamic. Because our research is derivative of constantly changing user insights, we plan to publish regular updates, as well as apply this approach to other software categories. Thanks for sharing this Howard, and your contributions to the report. The Demand Generation landscape is evolving quickly, and based on recent conversations, it’s a huge challenge for leaders to select a marketing automation platform, if they have not yet adopted one. This guide certainly helps clear some of the fog around the various vendors out there, but I think your comment that no one vendor is best for everyone is sounds advice. Each has its pros and cons. The details in the report reveal some important differences, and there’s good food for thought that could help an organization choose a different vendor, based on the company-size focus of that particular vendor (i.e. Eloqua having name awareness but looking better suited to Enterprise companies). The full report is worth a read! It also has an excellent content gate that I was impressed with. Great Buyer’s Guide! It’s always nice to see an outside perspective on companies in the industry? 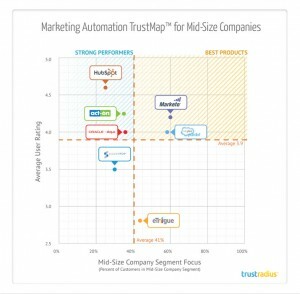 Do you have a Marketing Automation Trust Map for smaller companies as well? I’d be interested in seeing that as well, many of SimplyCast’s current customers fit into that bracket. Jennifer, the complete report includes separate Trust Maps for small, mid-sized, and enterprise companies.